Do your teas have caffeine? Yes, all real teas have caffeine. In general, Green tea contains the least caffeine, Black tea the most due to the oxidation process, and Oolong falls in the middle range. Also tea steeped in hot water for a longer time will release more of its caffeine than tea steeped with cooler water for a shorter period. A smaller leaf tea will release more of its caffeine than a larger leaf tea. A cup of Green tea (6 oz) contains 8 to 36 mg of caffeine. A cup of White tea contains 6 to 25 mg of caffeine. 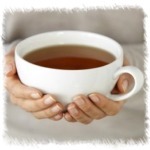 A cup of Oolong tea contains 12 to 55 mg of caffeine. A cup of Black tea ranges from 23 - 110 mg.
Coffee generally contains 60 - 180 mg of caffeine. How can tea be a healthy beverage if it contains caffeine? Caffeine in moderation can actually be good for you. It stimulates the nervous system and promotes blood circulation. It also works as a digestive after a heavy or greasy meal.Caffeine increases the body's metabolism for up to four hours, which may be part of tea's weight loss attributes (don't drink your tea with sugar if your intention is weight loss). You can also decaffeinate your own tea. Add hot water to loose leaves and steep for 1 minute. This first brew contains most of the caffeine of the tea. Add water to your teapot and let steep for 2-3 minutes and drink that infusion that has only small amounts of caffeine. Over 80% of the caffeine is removed during the first wash of the leaves.